Disclosure: This post is sponsored by Primalvore. However, all opinions are my own. 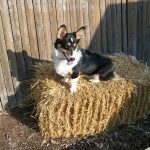 Readers of this blog know that I am a huge proponent of a high protein, low carbohydrate diet for my dogs. 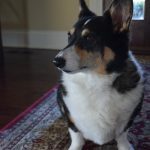 For Ty, who is in remission from Lymphoma, such a diet is necessary to help keep the cancer at bay. For Eve, who is sensitive to higher fiber food, it keeps her tummy happy. Bone broth is a great way to supplement your dog’s diet to add extra protein and nutrients without adding in fillers and carbs. It tends to be nutrient dense, and is a great natural source of amino acids, vitamins, and minerals. I have long been a fan of it. You can make bone broth, but it is a rather time consuming process, and I much prefer to use products that are already made for me. 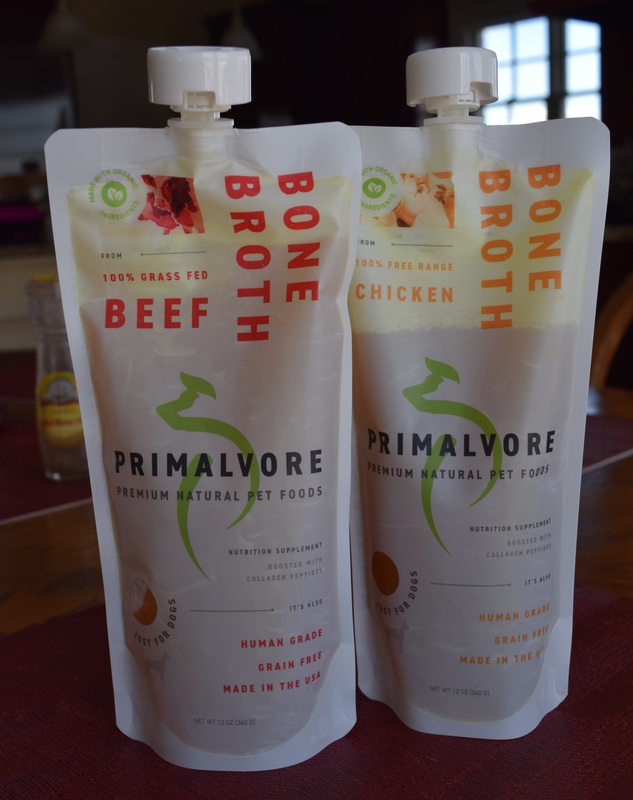 I was recently given the opportunity to try Primalvore Bone Broth, which is made by slow simmering bones and water for up to 20 hours, and then boosted with collagen and turmeric. I love the extra boost in it since both ingredients are helpful supplements for Ty and Eve. 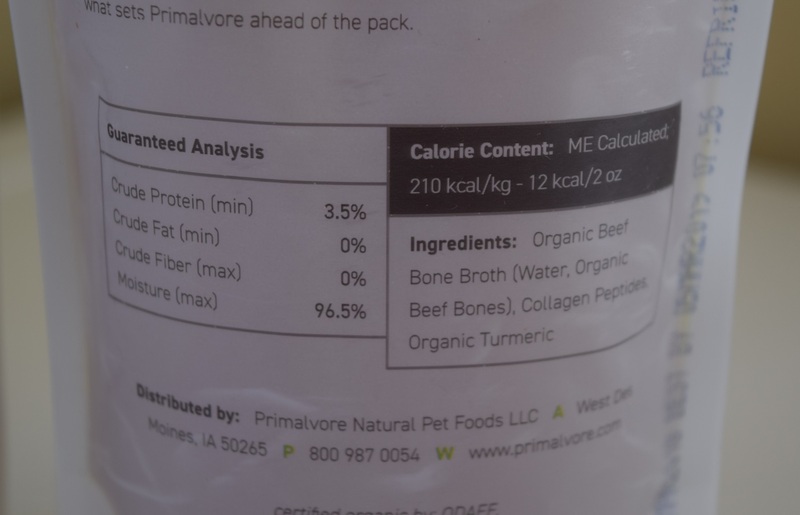 So, about those supplements: Primalvore adds a specific group of collagen peptides that are clinically tested to show improved mobility and joint health in dogs. It is also associated with a healthy coat and nails, boosts protein, and adds extra flavor. Then, organic turmeric is added, which is known for it’s anti-inflammatory properties. 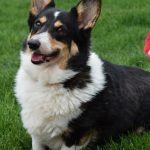 This is great for joint health, which benefits both Ty and Eve, who are retired from agility and each have their share of little aches and pains with aging. Turmeric is also an often recommended supplement for dogs with cancer, and I like giving Ty natural food items that are boosted with it. So, obviously, this is a great product for him. 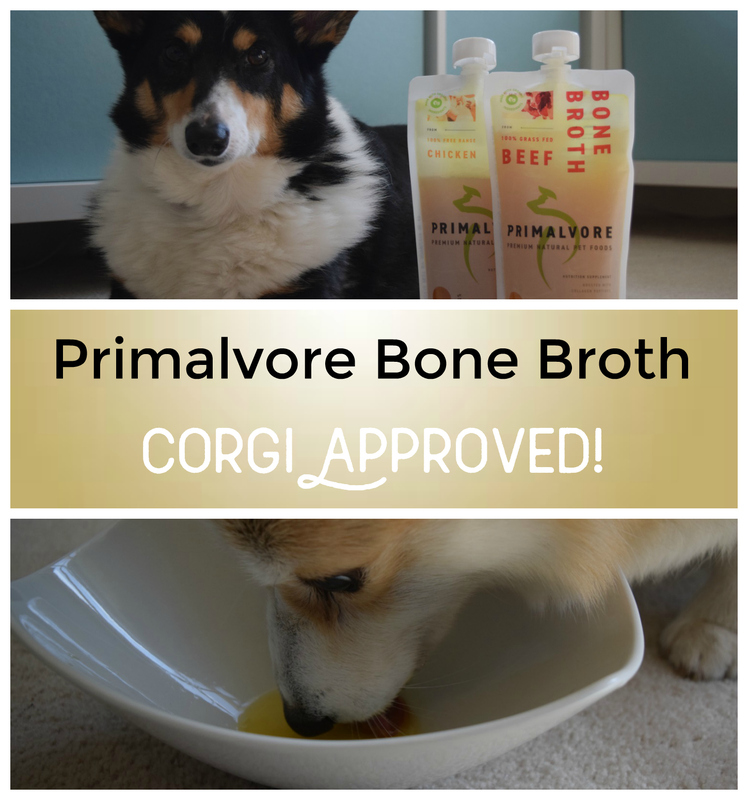 Adding bone broth to your dog’s diet is easy. 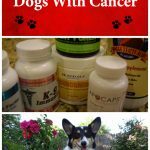 Here are three ways to use it, including a few notes here and there about using it for dogs with cancer or undergoing chemotherapy since I know that there are a good number of readers here who are facing food challenges related to canine lymphoma and other cancers. 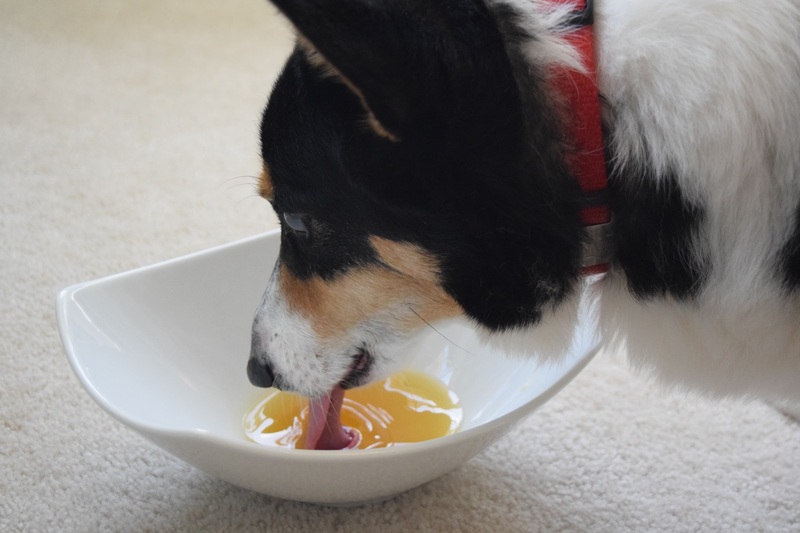 (1) Use it as a beverage: The simplest way to add bone broth to your dog’s diet is to simply serve it straight up as a beverage. This is especially great for after strenuous activity for hydration, or as a simple stand alone treat. It would be great for agility or other sporting dogs or for after outside activity. This would also be a great way to supplement the diet of older dogs that could benefit from the collagen and turmeric. The broth would also be perfect for picky eaters or for dogs that need some additional calories in order to gain weight. 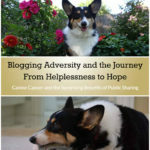 I used bone broth when Ty was undergoing chemo and refused food. 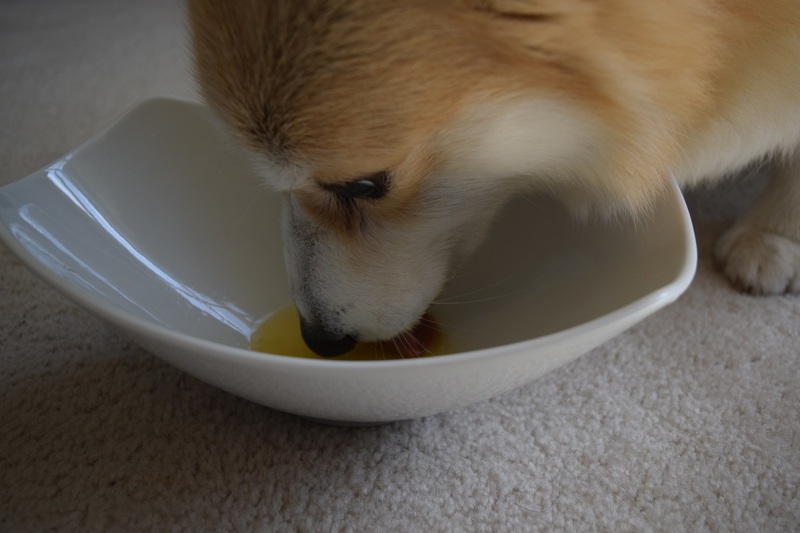 He was willing to drink broth, so it was a way to get some calories into him. I would have loved to have had Primalvore during that time because Ty loves it so! Do always inquire with your vet or oncologist first about adding turmeric or any other supplements during chemo. Depending on the type of chemo, some might wish for you to hold off until the chemo has cleared the system. 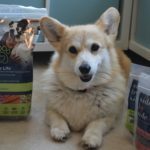 (2) Use it to rehydrate freeze dried or dehydrated food: My dogs eat freeze dried raw (Ty eats Primal) and dehydrated raw (Eve eats Honest Kitchen). These foods are typically rehydrated with water. By rehydrating with bone broth, you can up the protein and boost the flavor all at once. This is also a great way to nudge a dog with cancer who might be refusing food to give some solid food a try. (3) Use it as a kibble topper: I’m not a fan of kibble, as even the best formulas are typically full of binders that increase the carbohydrate load. Kibble also lacks essential moisture. But for those who use kibble, adding bone broth can help mitigate against some of the problems with kibble. 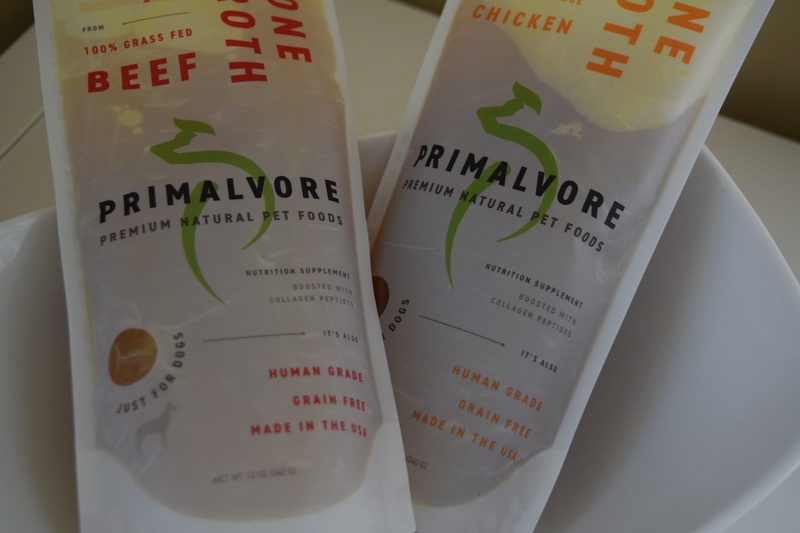 Moisten the food with Primalvore Bone Broth, and you have immediately added moisture, additional nourishment, more protein, and anti-inflammatory supplements. 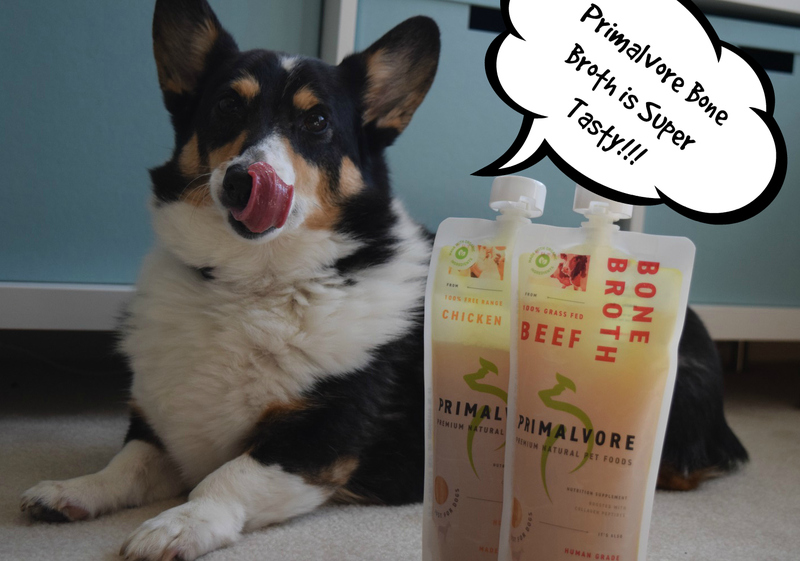 Ty and Eve were completely nuts about Primalvore Bone Broth! Normally, even for the tastiest of treats, they will politely stay on command for photos, knowing that they will get to have it when I am finished. They usually are excellent models. Neither wanted to hold still for the broth photos. Ty was jumping around and Eve could simply not contain herself and lunged right in. Each devoured their portion. I don’t think I have ever seen them drink so fast! So, needless to say, this is tasty stuff for dogs. We tested both chicken and beef flavors and they loved both of them. 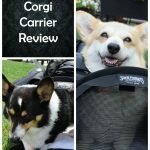 Primalvore gets a major corgi paws up approval rating from the dogs and a major thumbs up from me. 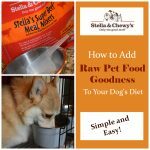 This is a great way to boost your dog’s nutrition with wholesome food. Learn more about Primalvore and purchase it at the Primalvore Website. Also follow Primalvore on Facebook, Instagram, and Pinterest. I am really happy to know about this product. 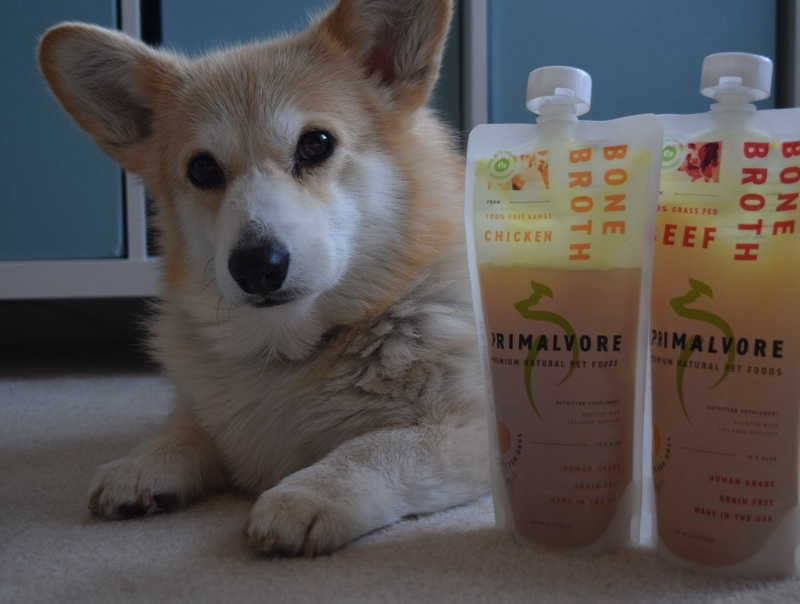 I have tried Caru’s Bone Broth and Ruby loves it. It’s nice to know of another alternative for bone broth. I have friend who actually makes her own but I don’t think I have the patience for that! Also, love that Primalvore Bone Broth includes Turmeric. I have jumped on the turmeric bandwagon and think it’s great for people and dogs. What a smart idea about using it to rehydrate hydrated food! Could it also be frozen and made into puppy pops? My dogs love frozen treats. Just wondering if that would break down the nutrients and ruin it. I don’t know for sure, but I don’t see why it couldn’t be frozen. I like the idea of that! Thank you Carleen I will have to get some and try it! If your dogs like frozen things go for it. My Lyla and Link LOVE frozen carrots and yogurt. I also make them a peanut butter yogurt treat now and then. Thanks for the info on this – I will get my dogs the duck flavor. Is that title a pun?? Hey folks what’s better than having a real, honest-to-goodness, phenomenal chef tell you how to feed your dog? I don’t think there’s anything better. I don’t think they make a cat formula, although bone broth in general is OK for cats and I think collagen and turmeric are as well. I would double check with an expert on that though. We have a really great restaurant in our area that offers bone broth for humans. I usually eat off their vegan menu, but I’ve been reading about bone broth benefits for humans. I’m glad to know it is available for dogs as well. I think my dogs would enjoy it! This looks and sounds delicious. 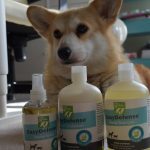 I am always on the prowl for new dog products that are good for my dog. This one fits the bill! That does look awesome; and so much easier than making one yourself 🙂 I haven’t seen these around here, though. I’ve heard that bone broth is an excellent source of nutrients for healthy and sick pets. I’ve never offered it to my dogs since they passed before this became a thing, but I would with any dogs in my future. Thanks for sharing. 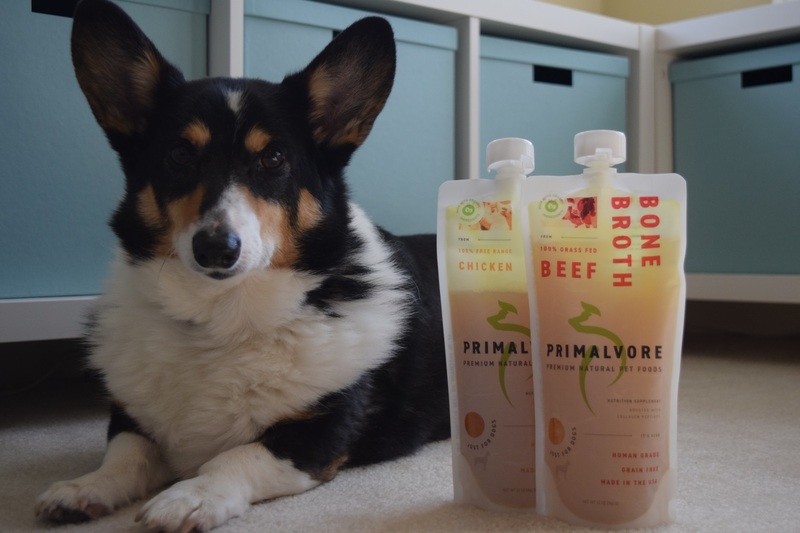 I’ve heard of bone broth being good for humans but didn’t know about dogs. 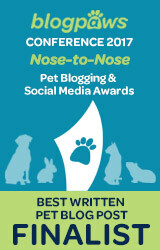 This is great information to have especially for older pets and those dealing with cancer. I remember with my cat Dusty reading about turmeric as a great way to fight inflammation and tumors. I had no idea about collagen having properties to help joints and mobility. 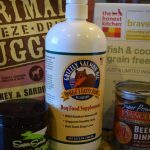 This is great to supplement your dogs diet so they can age well and potentially avoid arthritis. 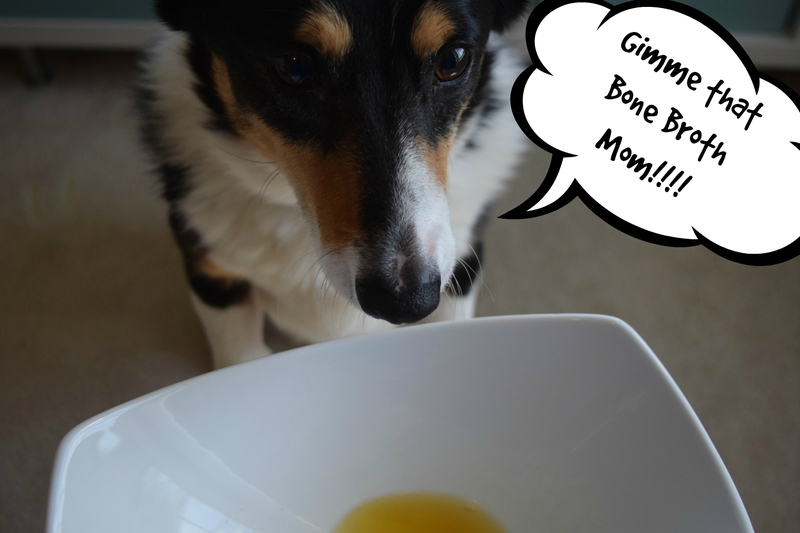 My Buffy loves bone broth! But we make our own, but don’t let it simmer for 20 hours and add tumeric. We just boil water with bones and make a broth out it. After it boils, we usually let it sit over night. I’m glad to know there’s an alternative to making it ourselves! What an interesting product. i could see this coming in handy for our long drives – it hydrates and provides some micronutrients. Def going to look into that. I make my own at home but I like the packaging for car travel. I’ve never heard of this product before, but I bet my dog would love it. I will definitely have to check it out. Thank you for the review! This looks amazing! Thanks for this. It was very informative. I’ll definitely look into it.